He's a man Scandal fans both love and love to hate. The one and only Cyrus Beene! TV Fanatic recently had the chance to chat with Jeff Perry to ask him about the political monster he portrays on ABC's hit series. 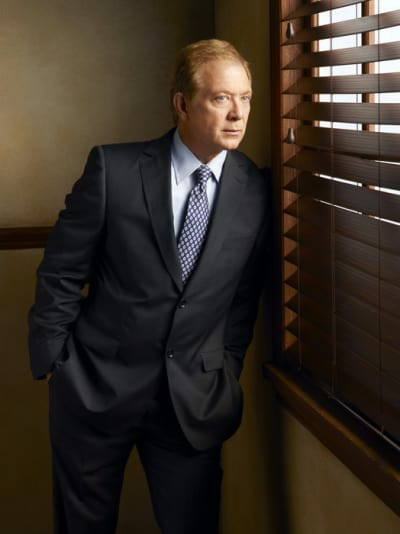 We started the interview with a simple question: "What's it like to play Cyrus Beene?" Perry's response? "Heaven. Ice cream. Christmas. Hanukkah. Thanksgiving. I love it. I adore it." We love that he loves and adores it. Perry gives the credit for his character to show creator Shonda Rhimes who is, he says, "a genius at creating dichotomous, complicated, passionate, surprising humans" whom she puts into "pressurized predicaments that are somehow simultaneously suprising yet feel organic and authentic." One such situation is Cyrus' recent partnership with Mellie Grant as the two work to get Fitz reelected. "They really test each other sometimes," Perry said. "They're two people on an all-star basketball team who are demanding the ball but they're joined at the hip and really kind of, in these recent episodes, they're kind of getting a great kick out of working together. There's a level of camaraderie we would never have expected." Despite his nature and reputation for being a strategist, Cyrus, Perry told us, is a man with "a deep strain of idealist thinking." Part of that idealism is related to his marriage to James Novak, which, after Scandal Season 3 Episode 8, is on rocky terrain. James, Perry says, is Cyrus' "Achilles heel." His character was blindsided by James' apparent infidelity and that shock will force Cyrus to confront a major error in his judgment. He may have sacrificed both Fitz' chance to be reelected and his marriage. "I may have screwed everything up fatally," Perry said. "Everything Cyrus values, despite his rampant whirling dervish attempts to keep everything in line, this little plan may have backfired gigantically." We won't have to wait long to find out. The first of Scandal's two-part winter finale airs tonight at 10/9C on ABC. Check out the promos for Scandal Season 3 Episode 9 now and then head back here after the episode airs for the full review.